Babak Hedayati chosen as an influential member of the entrepreneurial community to evaluate entries to the 2016 New Venture Competition. I am honored to participate in such a prestigious competition. 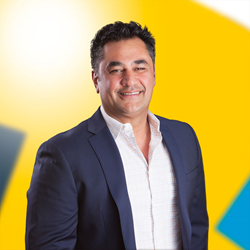 Babak Hedayati is the Co-founder of TapClicks, Inc., a marketing technology company that delivers unified digital marketing operations solutions, including analytics, reporting, workflow and order management. The Harvard Business School New Venture Competition (NVC) is an annual competition hosted by HBS that supports both Harvard students and alumni in launching new business and social impact ventures. Entrants to the competition can participate in one of fourteen regional competitions held around the globe, before coming together in Boston to compete for the grand prize of $50,000. “I am honored to participate in such a prestigious competition,” said Hedayati “and to be involved in a program that has served as the launching pad for many notable businesses such as Birchbox. This competition serves as a building block on which future entrepreneurs can learn and grow their ideas, and HBS is where leaders such as Bloomberg and Stoppelman and many others came from,” he continued. Judges of the NVC are exclusively selected from a variety of backgrounds based on their expertise. Hedayati, who served in some of Silicon Valley’s most successful Fortune 500 companies in his career, will serve as one of the few premier judges who will review the entries that make it to the final round of competition in April. Judging will take place on the aptly named “Super Saturday” on April 2, 2016. The winning teams will be announced at the final event on April 26, 2016. For more information on the NVC and the upcoming events, visit: http://www.hbs.edu/newventurecompetition/Pages/default.aspx. To learn more about Babak Hedayati and TapClicks solutions, visit TapClicks.com or follow us on Twitter at @TapClicks. TapClicks, Inc. is a marketing technology company that delivers complete digital marketing reporting and analytics platforms to digital agencies, media companies, and enterprises, for improved marketing ROI. Its suite of products includes flagship TapAnalytics, which consolidates marketing campaign information and performance results into a unified digital dashboard, with automated reporting and analytics.TapAnalytics has enabled over 1,000,000 dashboards worldwide, at digital agencies and their clients, local media agencies, and enterprises spanning automotive, travel, real estate and more. TapClicks was founded in 2009, and operates out of offices in Silicon Valley, Boston, Canada, Europe and Latin America.